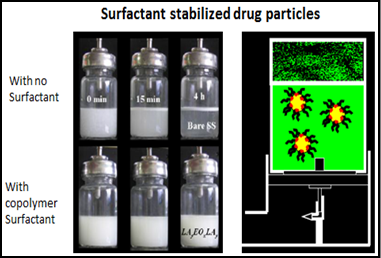 A series of novel co polymer surfactants with the general structure LAmEOnLAm were developed along with a Colloidal Probe Microscopy (CPM) method to optimize the surfactant composition using adhesion forces to improve stabilization of drug dispersions. This expands the range of biomolecules and micronized drug particles that can be formulated with pMDIs. New pharmaceutical compositions can be tested and the ideal co-polymer surfactant composition optimized through quantitative measurement of cohesive forces. The biodegradable and biocompatible lactide-based amphiles chosen can stabilize drug dispersions in HFA propellants used in pressurized metered dose inhaler (pDMIs) formulations better than existing excipients. pMDIs are still the most frequently prescribed inhaler device in the world and various spacer combinations and breath-actuated devices have recently improved patient compliance. The technologies developed at WSU directly address the challenge of reformulation pMDI drugs from traditional CFC propellants to more environmentally friendly Hydrofluorakane (HFA) propellants. While several HFA propellants have been developed, especially for new and insoluble active pharmaceutical ingredients there is still a limited selection of excipients compatible with HFA and safe for human use. Very specific size requirements and strong interactions between particles and intrinsic barriers need to be overcome in order to deliver therapeutics to the lung epithelia. The WSU inventions greatly expand the range of therapeutics that can be delivered using pMDIs through compositions and methods to achieve optimal formulations.